As promised, bronchitis it’s football food week here on BitchinCamero and nothing says football like sticky, spicy wings. 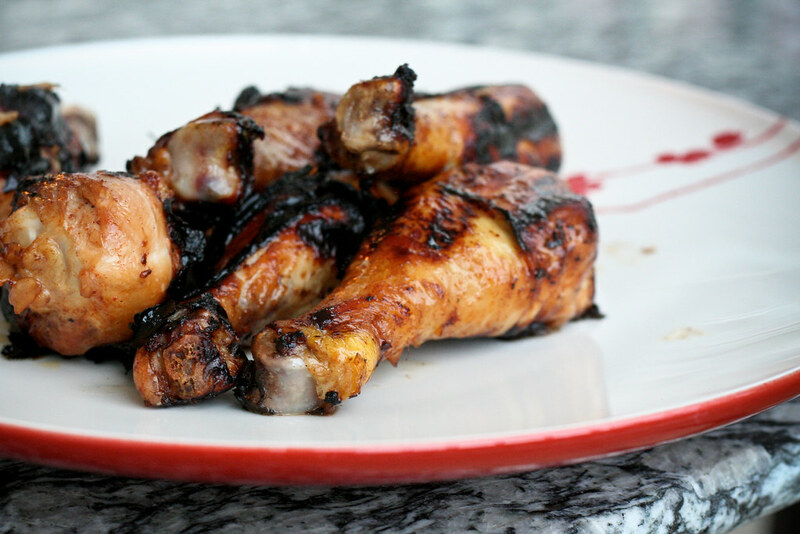 And nothing is better than grilling during the fall, so I present these Grilled Honey Garlic Wings for your tailgating pleasure. These wings were marinated for hours in a special marinade of honey, garlic, mustard, Worcestershire sauce, soy sauce, smoked paprika and cayenne. When I threw them on the grill, the honey and garlic caramelized to a lovely dark brown. The wings were sweet, spicy and so tender. Our fingers were sticky, our faces messy. You gotta love wings. Whisk all of the ingredients (except the chicken!) in a big bowl. Place the chicken in the bowl with the marinade, making sure each piece is evenly covered. Cover the bowl, refrigerate and let marinade for at least an hour, or overnight. Preheat your grill or grill pan to medium-high heat. Place the chicken on the grill and cook for about 7 minutes on each side (25 – 30 minutes total), or until the chicken is cooked through, the skin is crisp and the outside is a caramel brown. This has got Sunday Football written all over it. Great recipe Mel. Can I say I love these, er, even before I tried them? I am a sucker for chicken wings… and I must say you had me at “Grilled Honey Garlic” and the smoked paprika just sealed the deal! Awesome awesome recipe! Pretty standard marinade. It’s good, though. There’s lots of salt in soy sauce, and salt is crucial in a marinade. Soy sauce, I’ve been told, gives a more “complex flavor” then salt from a shaker. I punch fork holes in the meat before marinating it. My understanding is that marinade only goes about an inch below the surface no matter how long you let it sit before cooking, and that 24 hours is usually no better than one hour. I then put the chix and the marinade in a plastic bag, and refrigerate, turning the contents of the bag once or twice. When I take it ou of the frig, I drain off most of the marinade, to make it less flammable in the grill. I’d be very interested in knowing what other people do– how you work with a marinade can be at least as important as what’s in it. These were very delish! I added a few more kick spices! <3 them!